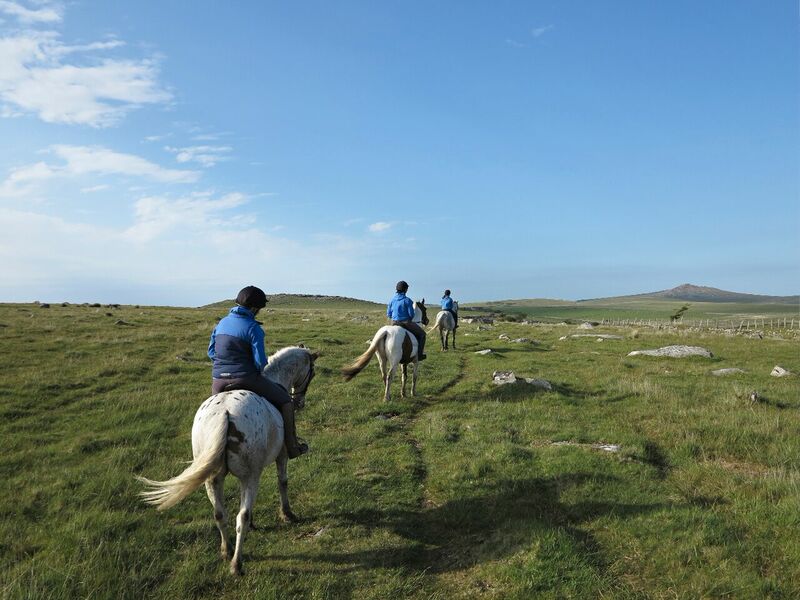 We offer a fantastic selection of trail rides for experienced riders, from 3 to 7 hours duration, exploring some of the beautiful scenery on Bodmin Moor. It is possible to incorporate a pub lunch on some trails, or we can also provide picnic lunches if required, at a supplement. Prior to joining us for a Trail Ride, all riders need to be experienced in galloping in open spaces. We therefore need to assess riders during a 1 or 2 hour assessment ride prior to booking a trail ride. Assessment Ride: From £35 per person per hour. 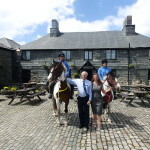 Own Horses welcome – please call us for very special rates and for more information. 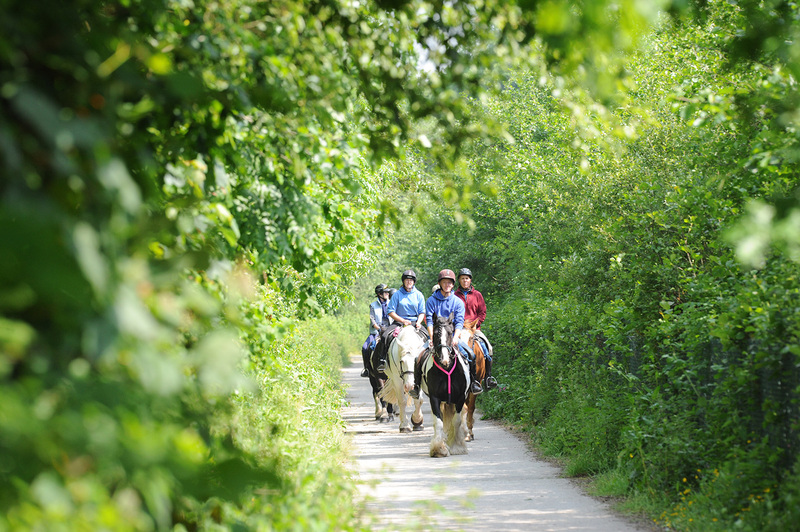 Our Trail Ride Programme features different trails every week – please click here for our latest schedule. Trail dates/routes may change according to weather and ground conditions. Our popular River Valley Trail takes in the contrasting scenery wild scenery of Bodmin Moor and the sheltered valley of the River Camel, which flows into the sea at Rock and Padstow. We head out from Hallagenna across Bodmin Moor before joining the Camel Trail. If we are lucky we might catch sight of the steam train on the Bodmin – Wenford railway line. We have time to enjoy a pasty lunch before a pleasant ride back to Hallagenna. £160 per person including pasty . 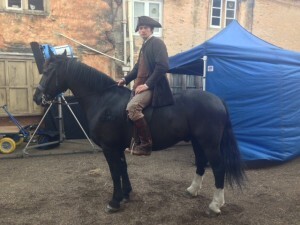 Our Instructor Jen was involved in handling the horses when the BBC series was filmed around Hallagenna. To celebrate the fantastic scenery featured throughout the series we’ve launched a Poldark Trail. During this trail we visit several of the sites used for filming to give riders a real feel for “Poldark” country. This trail will only be available to Experienced Riders (riders comfortable at walk, trot and canter). Throughout the trail you will experience countryside and terrain ridden by those filming both the original and the new Poldark series and pass Ross Poldark’s Home. The trail is available as 2 hours (£65 per person) or 3/4 hours (£110 per person). Our newest trail takes in some of the wildest scenery on Bodmin Moor, which again featured as a stunning backdrop to the Poldark series. This trail lasts 7 – 8 hours, at times following some of the old smuggler’s routes across the Moor until we reach the infamous Jamaica Inn, high on the Moor. We stop there for a refreshing lunch whilst our horses relax in their own paddock. Riders can choose from the newly-refurbished Inn’s extensive menu (extra cost) before saddling up to commence the ride back to Hallagenna. This scenic, challenging trail lasts 3 – 4 hours and takes you towards Delford Bridge for a splash through the De Lank River, before heading across Kernow Downs and out onto the vast Manor Common. From there you will see two of the many Tors or rocky outcrops on the Moor – Carbilly Tor (from the Cornish “carn ebilly” meaning “Colt’s Tor”) and Hawks Tor. We’ll also visit the Trippet Stones, a Bronze Age standing stone circle said to be maidens turned to stone for dancing on the Sabbath. We then cross Manor Common and visit the pretty moorland village of Blisland, where we hitch up the horses on the village green outside The Blisland Inn and enjoy a lunch stop. After enjoying some welcome refreshment we then mount up and head to Pendrift Downs to visit The Jubilee Rock. This huge granite rock was carved in 1809 – 10 by Lieutenant John Rogers and his men to commemorate King George III’s jubilee. It features Britannia and various Coats of Arms and is updated with new carvings on special occasions. After visiting some of the most interesting corners of the Moor we finally head home to Hallagenna. 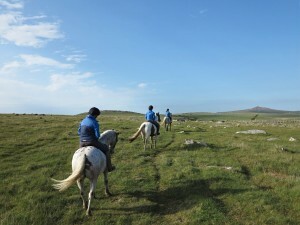 This Trail Ride takes you out across the Moor to Alex Tor, from where you can take in the breathtaking moorland views reaching as far as the North Cornwalll Coast. 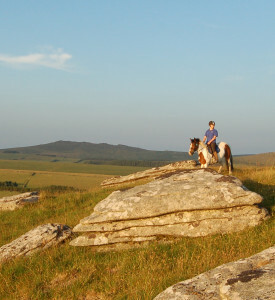 We then ride on to Rough Tor, which at 1,313 feet, is the second highest point in Cornwall. At the summit is a “logan” rock, a huge piece of granite which will rock gently if you stand on the right spot! 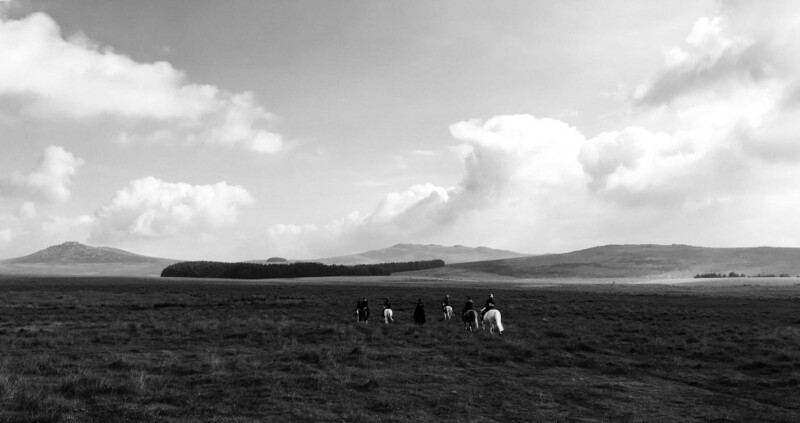 From Rough Tour and its many Bronze Age hut circles, we head through woods to Davidstow Moor. Davidstow Airfield once played an important role during the Second World War. We ride alongside the highest point in Cornwall at 1375 feet – Brown Willy or Bronn Wennyly in Cornish, meaning “Swallow’s Hill.” We ride past further stone circles and ancient signs of settlements before coming to Casehill Downs and King Arthur’s Hall. This is one of the most fascinating sites on the Moor, thought to be an ancient Neolithic or early Bronze Age ceremonial site. It consists of roughly fifty-six stones arranged in a rectangle with a bank of earth around them. We then head home to Hallagenna. We are also able to offer guided trail rides from 3 – 7 hours for those riders bringing their own horses.